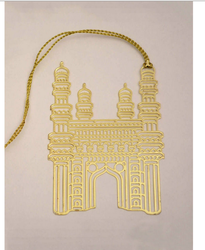 This Metal Bookmarks are Hand Crafted in Brass and are gold plated. They are a definite conversation starter, enhance your work desks and livens up your reading sessions. Stunning and impressively creative, this Metal Filigree Bookmark will enhance the beauty of any book! Crafted out of fine metal and gold in color, it is a great gift for book lovers. Use this fun bookmark to mark your notes with this super thin Bookmarks from EZ Life! Our well facilitated infrastructural unit enables us to make a highly qualitative Golden Metal Bookmark, which is developed by making use of excellent quality components.